Definition: The Oligopoly Market characterized by few sellers, selling the homogeneous or differentiated products. 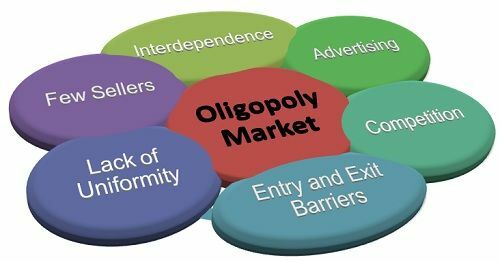 In other words, the Oligopoly market structure lies between the pure monopoly and monopolistic competition, where few sellers dominate the market and have control over the price of the product. Homogeneous product: The firms producing the homogeneous products are called as Pure or Perfect Oligopoly. It is found in the producers of industrial products such as aluminum, copper, steel, zinc, iron, etc. Heterogeneous Product: The firms producing the heterogeneous products are called as Imperfect or Differentiated Oligopoly. Such type of Oligopoly is found in the producers of consumer goods such as automobiles, soaps, detergents, television, refrigerators, etc. Few Sellers: Under the Oligopoly market, the sellers are few, and the customers are many. Few firms dominating the market enjoys a considerable control over the price of the product. Interdependence: it is one of the most important features of an Oligopoly market, wherein, the seller has to be cautious with respect to any action taken by the competing firms. Since there are few sellers in the market, if any firm makes the change in the price or promotional scheme, all other firms in the industry have to comply with it, to remain in the competition. Thus, every firm remains alert to the actions of others and plan their counterattack beforehand, to escape the turmoil. Hence, there is a complete interdependence among the sellers with respect to their price-output policies. Advertising: Under Oligopoly market, every firm advertises their products on a frequent basis, with the intention to reach more and more customers and increase their customer base.This is due to the advertising that makes the competition intense. If any firm does a lot of advertisement while the other remained silent, then he will observe that his customers are going to that firm who is continuously promoting its product. Thus, in order to be in the race, each firm spends lots of money on advertisement activities. Competition: It is genuine that with a few players in the market, there will be an intense competition among the sellers. Any move taken by the firm will have a considerable impact on its rivals. Thus, every seller keeps an eye over its rival and be ready with the counterattack. Entry and Exit Barriers: The firms can easily exit the industry whenever it wants, but has to face certain barriers to entering into it. These barriers could be Government license, Patent, large firm’s economies of scale, high capital requirement, complex technology, etc. Also, sometimes the government regulations favor the existing large firms, thereby acting as a barrier for the new entrants. Lack of Uniformity: There is a lack of uniformity among the firms in terms of their size, some are big, and some are small. Since there are less number of firms, any action taken by one firm has a considerable effect on the other. Thus, every firm must keep a close eye on its counterpart and plan the promotional activities accordingly. Nice presentation ….☺keep this up…..
Great piece of article for business students. It was very helpful for me. It’s so helpful to me. Thanks for a good theory.